A few years later and AMG were now filming a wide variety of events including the Ford KA rally championship along with rounds of the BTRDA rally series. 2006 saw a busy year with work now extended to both circuit racing and rallying and included the new Ford Fiesta Sporting trophy-a championship run by the Ford world rally team M-Sport, as well as a whole host of racing series that included Scottish Mini Cooper Cup and the Ford Saloon Car Championship. In 2012, AMGTV were approached by Premier Sports to provide coverage of Short circuit racing that included the UK Mascar championship and the Formula One Brisca Stockcars. This proved to be a new challenge with the action being very close to camera positions and requiring a new style of editing. AMGTV have used the Grass Valley Edius package since its launch, and are still using it today, the multi format "anything in, anything out" format being perfect for fast turnaround of programmes, where quite often incar footage from various differing units can be supplied at the last minute and needed to be slotted into the edit. "We made the decision to go with the Panasonic P2 format as our main camera source, finding it really robust despite the cost of the P2 cards, and we are still using it today- although we now have several freelancers using Sony PMW500s etc too" says Manager and owner Andy Glossop. Initially the stockcars were filmed in camera and then all edited together back in the office, but in 2013 a decision was made to convert the company motorhome into a small live production facility, using predominantly Black magic Design kit and an Atem 1. "The Atem really changed the way we could film the stockcars, being able to see all the cameras and direct the operators allowed for quick decisions and the overall product really improved. We started looking at how we covered other events too and did our first Livestream race meeting in August 2013 at Mallory Park race circuit." 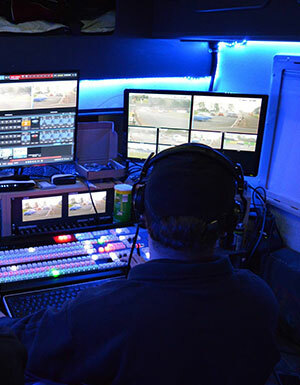 In 2014 AMGTV were appointed as the production company for the British Rallycross Championship, and it soon became apparent that a bigger vehicle and production unit was needed, so a new 7.5 tonne truck was purchased and fitted out with a new Tricaster Unit and KA satellite enabling the company to not only produce the tv programmes but also Livestream each event. 2 trips to Holland were also included in this year, again providing livestream for a variety of motorsport events. "We've now upgraded the Tricaster to the full 8000 advanced edition, which is amazing, giving us not only amazing multi camera options, virtual studios, basic replays,and great Audio control, but the biggest bonus for us is we can produce live content with a very small crew and all in one 7.5t vehicle"